So this is Lesbi-honest by ManGlaze. All their polish is matte. They have some beautiful colors with colorful names. 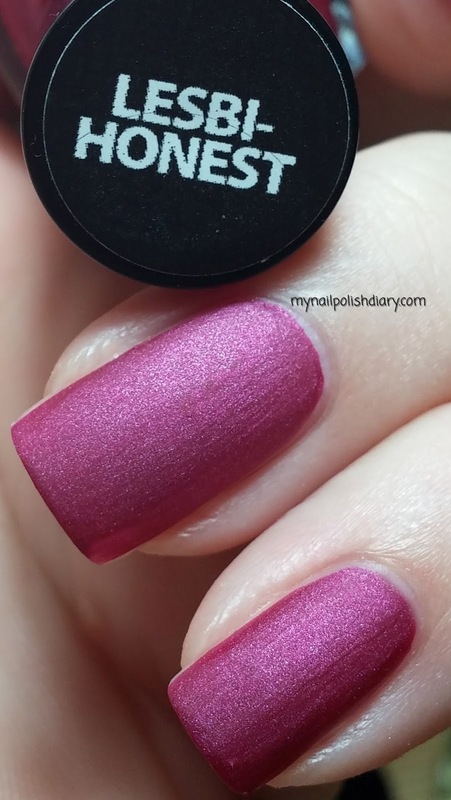 Lesbi-honest is a fuchsia matte with a shimmer. It applies like butter. So smooth and easy. It could be a one coater, but I did two. I love the look of matte polish. I guess there is one thing I don't like about wearing a matte: You're not supposed to use lotion while you wear them. I use lotion and cuticle oil several times a day. I may just have to use it anyway!